It has been an amazing ride! In the past three weeks it has been none stop with multiple bus rides, flights and ministries. After arriving in Norway we took a few days off to adjust to the time. The girls have been amazing and adjusted well to the time change but have had a little more difficulty adjusting to the, none stop schedule. After spending some time in the small town of Grimarud, Norway helping to complete some remodeling work for the YWAM base we headed to the south of Norway to a beautiful little town of Grimstad. 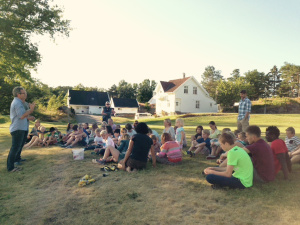 In Grimstad we had the awesome opportunity to participate in a family camp with 150 people. Jessica helped run an art class for children from 9 to 19 while I helped run a sports program for the kids, teaching them to play American football and ultimate Frisbee. During the week 23 children committed their life to Jesus, 9 of them for the first time ever, which was amazing and beautiful to see. Jessica and I had a wonderful opportunity to share our testimony to all the adults and while we saw little fruit from our vulnerability we did see many tears during our testimonial time and our prayer is that a seed may have been planted if someone is struggling as Jessica and I have. We pray that our testimony will provide couples with the hope, love and grace that is in Jesus. Following the family camp in Norway we jumped on a 2-hour plane ride to Manchester, GB, followed by a 1-hour car ride to Stafford. When we flew into Manchester we were stopped for our visas and were almost denied access into the country. We waited for about 45 minutes and prayed as a group of people discussed our fait. After a verbal tongue lashing from a not to kind British woman we were allowed into the country under a 6 months workers visa. After arriving to Stafford we realized we were staying with a wonderful family that allowed us to sleep in their bed and invade their home. Jessica and I felt like we became instant best friends with them and felt so blessed to be staying with them. The couple was around our age and had 3 kids ages 5, 3 and 1.5. Harper and Teagan were in heaven with the amount of toys that they were able to play with. During the week we worked with an amazing Church named Rising Brook Baptist Church. The church is so much in the community it was awesome to see the many ministry opportunities. During the day they run an amazing coffee shop and restaurant to reach out to the community. Jessica had the privilege of hanging out in the coffee shop during the morning and talking to the many mothers that would come in during Café Totes. While Jessica was talking to the mothers I had the amazing privilege of fixing up a home for one of the members of the church. I helped put in a new toilet, clean the front yard and paint. The family that I was working for was a hard working family that has had a hard time in the past few years. On the final Sunday at the church Jessica and I were once again asked to share our testimony in both services. I was a little worried to be vulnerable again because of the lack of response from our testimony in Norway but we knew that God was with us and he wants to use us. So after a very rough Sunday morning getting packed up and arriving to the church a little late we were once again put in front of a church body. We only had 5 minutes to share what God has brought us through but in both services God showed up and the Holy Spirit was at work. There were very few dry eyes in the crowd and after the service a lot of people approached us to ask for prayer and healing. After the second service Jessica and I prayed for individuals and couples for about 30 to 45 minutes after the service. I don’t say this to boast but to show you how amazing our God is and how he can use brokenness and a mess of a family to touch others and provide hope and healing. Not that Jessica or I were doing anything other then being vulnerable and the Holy Spirit was moving. Our hope is that if you are reading this and you may be in a valley season of your life, lean into the Father because he is preparing to use you for his Kingdom. Have faith that while life is a little messy you are not alone and the Father is walking with you and wants to use your beautiful messiness to grow show his love and grow his Kingdom.